German rabbi; born Oct. 19, 1826, at Birnbaum, province of Posen; died at Breslau Nov. 3, 1890; son of Rabbi Heimann Joël of Birnbaum. In 1849 he went to the University of Berlin to study classical philology and philosophy. In 1852 Joël passed his examination as "Oberlehrer," and took the Ph.D. degree at Halle in 1854. In that year he accepted a call to the Jewish Theological Seminary of Breslau, where he taught for nine years. In 1864 he was appointed successor to Abraham Geiger, rabbi of the Breslau congregation. Joël's first literary work consisted of biographies of the most prominent followers of R. Akiba—R. Meïr, R. Simeon ben Yoḥai, R. Jose ben Ḥalafta, and R. Judah ben 'Ilai ("Monatsschrift," 1855-57). His preference, however, was for religious philosophy, in which he was to do pioneer work. His series of essays on Ibn Gabirol ("Monatsschrift," 1857-59; reprinted in his "Beiträge zur Gesch. der Philosophie," 1876) was intended as a critical review of Solomon Munk's "Mélanges." He shows Ibn Gabirol's "Meḳor Ḥayyim" to be nothing but a text-book of Neoplatonic philosophy, and that its author had no claim whatever to originality. Joël then turned his attention to Maimonides, devoting two papers to him, one being a comprehensive account of Maimonides' system ("Die Religionsphilosophie des Moses ben Maimon," in the Breslau Jew. Theol. Seminary Program of 1859; reprinted in "Beiträge," i. ), the other proving him to be one of the sources of Albertus Magnus ("Verhältniss Albert des Grossen zu Maimonides," in the Breslau Jew. Theol. Seminary Program of 1863; reprinted in his "Beiträge," i.). After this Joël devoted himself to the exposition of the systems of two almost forgotten Jewish philosophers, Levi ben Gershon ("Levi b. Gershon als Religionsphilosoph," in "Beiträge," i.) and Ḥasdai Crescas ("Don Chasdai (Crescas' Religionsphilosophische Lehren in Ihrem Geschichtlichen Einflusse Dargestellt," in "Beiträge," ii.). Inquiry into the philosophy of the latter led Joël to the discovery of Spinoza's dependence on Jewish thinkers ("Spinoza's Theologisch-Politischer Tractat auf Seine Quellen Geprüft; zur Genesis der Lehre Spinoza's," in "Beiträge," ii.). 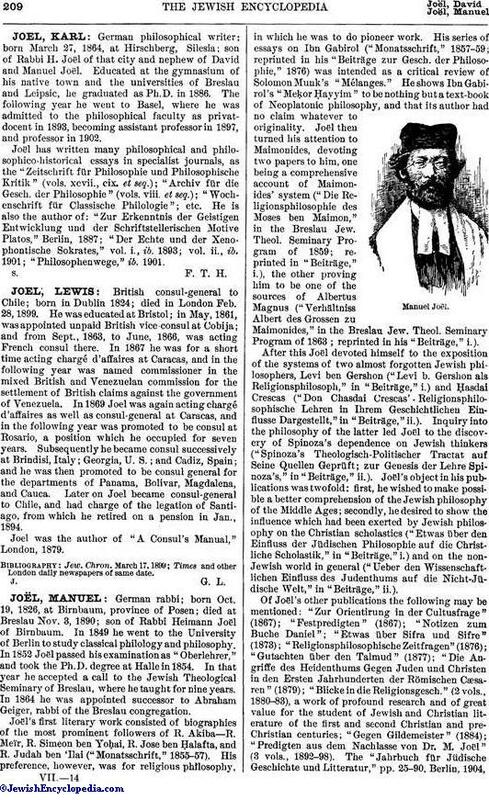 Joël's object in his publications was twofold: first, he wished to make possible a better comprehension of the Jewish philosophy of the Middle Ages; secondly, he desired to show the influence which had been exerted by Jewish philosophy on the Christian scholastics ("Etwas über den Einfluss der Jüdischen Philosophie auf die Christliche Scholastik," in "Beiträge," i.) and on the non-Jewish world in general ("Ueber den Wissenschaftlichen Einfluss des Judenthums auf die Nicht-Jüdische Welt," in "Beiträge," ii.). Of Joël's other publications the following may be mentioned: "Zur Orientirung in der Cultusfrage" (1867); "Festpredigten" (1867); "Notizen zum Buche Daniel"; "Etwas über Sifra und Sifre" (1873); "Religionsphilosophische Zeitfragen" (1876); "Gutachten über den Talmud" (1877); "Die Angriffe des Heidenthums Gegen Juden und Christen in den Ersten Jahrhunderten der Römischen Cæsaren" (1879); "Blicke in die Religionsgesch." 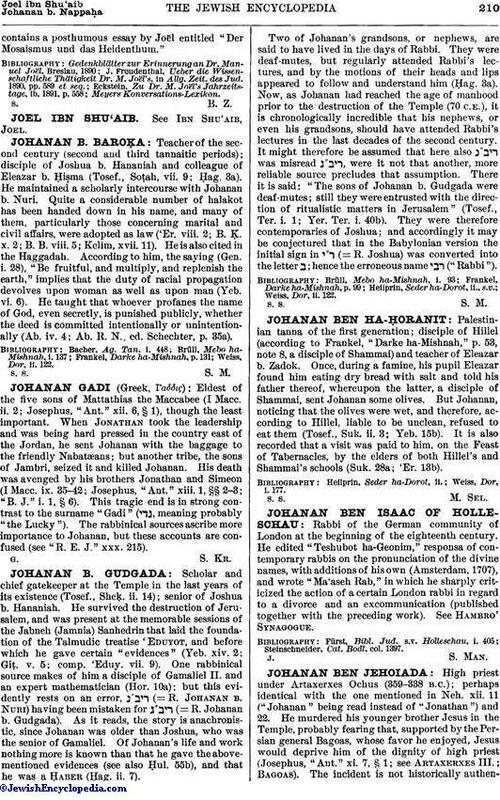 (2 vols., 1880-83), a work of profound research and of great value for the student of Jewish and Christian literature of the first and second Christian and pre-Christian centuries; "Gegen Gildemeister" (1884); "Predigten aus dem Nachlasse von Dr. M. Joël" (3 vols., 1892-98). The "Jahrbuch für Jüdische Geschichte und Litteratur," pp. 25-90, Berlin, 1904,contains a posthumous essay by Joël entitled "Der Mosaismus und das Heidenthum."